There are 3 first floor Suites available for guests, each with ensuite and balcony. 2 suites have a lounge area and enjoy sea and coastal views of Bream Bay and 1 suite is smaller and enjoys bush views. There are no kitchen facilities available but homemade continental breakfast is included in the rates. Tea and coffee facilities are in the Tui and Kingfisher Suites and available in the Conservatory. A formal lounge and conservatory is available for relaxing as well as a choice of outdoor decks in the bush for that perfect cup of tea, or evening glass of wine. 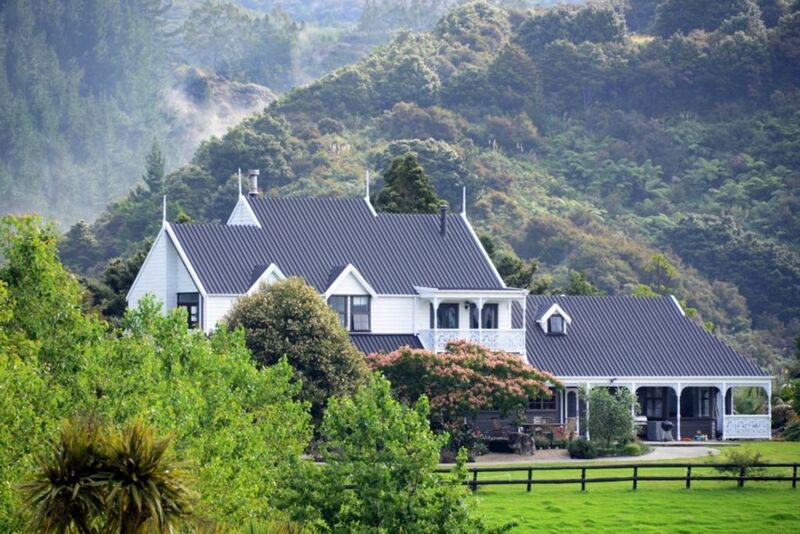 The property is run using organic and sustainable principles with permaculture vege gardens and paddocks for a rare breed of Arapawa black sheep. Spacious guest suites, tranquility and lovely views, make this a comfortable and restful place for guests to stay combining coastal paradise with a small farm. The historic Scottish town of Waipu is a 10 minute drive. Nearby there are beautiful beaches for swimming and surfing. 2 golf courses, Waipu underground caves, and wonderful coastal walks are all close. The stunning Cove coastal walk is within minutes of the Homestead. And the famous Waipu Pizza Barn is a must for dinner.